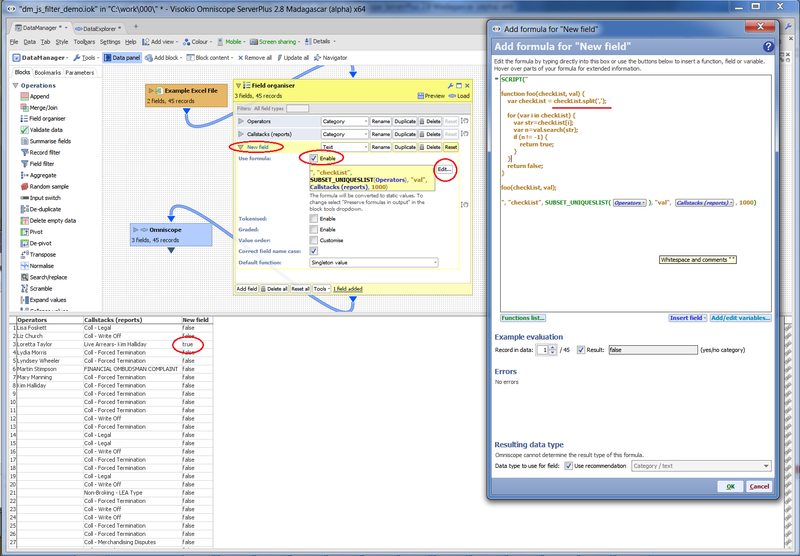 Hi Justin - Can you attach here an example file with some abstract dummy data (1,2,3..), the script and describe in which part of Omniscope you are using the script and the result you are trying to achieve (do you want to change the actual data in the DataManager or you want to show the result in the Content View?). I am attempting to use the above script (which is correct apart from the "subset("Con_L2Callstackdesc",array2[i]) += "DINGDING" " bit - con_L2etc is the name of the call stacks field. The script is in a formula in a field organiser operation, being performed on "Operators" field. I don't need to modify the source data, just publish a spreadsheet at the end with all teh callstacks that have names in them, and none of those without. I have successfully done this by entering all 28 names into a record filter and using the "contains" operator - but this process is not automatics, and should a name be added that record filter would have to be changed manually. Rather, we want to read them in from a spreadsheet (hence "var array1 = subset_uniquesList("Operator");") so its automatic. What I wanted to do with the above script is essentially what I did with the record filter in the manual version - but I can't seem to do it. HELP! I only started using Omniscope 3 days ago, and my Java is... non-existent, though my c++ is reasonable. Justin - Currently, record filter only supports single-value filtering, but Merge/Join works just as well for filtering against defined lists since you can branch/keep only the matching records. Hi Justin - Use the demo IOK file in the attachment as an example. There are two records with true value in the "New field". You can filter them by adding another DM block. Thanks that's great. I managed to solve the problem in 2 other ways eventually, first by reading all the names in, aggragating them, using search and replace to remove the commas from the aggregated string and replacing them with "|" ("or" operator for regular expressios) and then using the regular expression search to filter all the correct entries. Alternatively, creating a configuration table for batch publishing using the list of names and then running a "contains" filter in the batch publish achieves the same result.